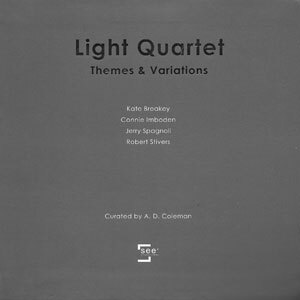 "Light Quartet: Themes and Variations" was the third in an ongoing series of small exhibitions I have curated for See+ Art Space/Gallery in Beijing's 798 Art District, starting in spring 2008. Opening on June 6, 2009, this show ran through July 18 of that year, introducing the audience in mainland China to four mid-career photographers from the U.S.: Kate Breakey, Connie Imboden, Jerry Spagnoli, and Robert Stivers. (Breakey, who emigrated from Australia, now lives and works in Tucson, AZ.) I chose these picture-makers — who were unacquainted with each other at the time — to represent the diversity of craft practice and image content among the creative photographers of their generation in the west.